DO NOT ORDER FROM THIS COMPANY. I ordered a replica of a Pnina Tornai gown from a Chinese factory, Ella Bridal Dress. I worked with Jaime and the communication was good until there was dissatisfaction then not good at all. 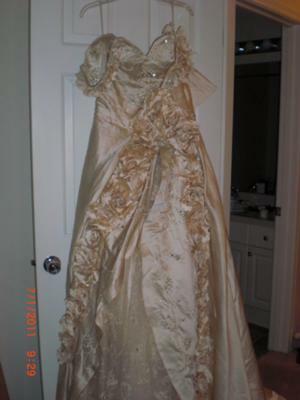 I have attached the original Pnina dress photo and the dress that I received. I had asked Jaime to match the color to the original Pnina dress. I told Jaime that I did not want white, but the original dress was not white and looked off white but that I wanted to know what color they had in the factory would match the original color. Jaime gave me the color number and said â€œwe can match the color, no worries. I repeatedly told them that I wanted the color exactly to match and Jaime repeatedly said they could match it. Jaime did say the workmanship would be 90% match which I was okay with. When I got the dress it was in a ball in the post office. Literally, they rolled the dress into a ball on the floor wrapped a dark plastic bag around it and slapped a label on it. I was shocked, but crossed my fingers. 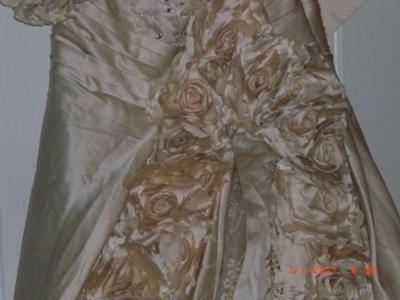 When I got the dress out it was tan/pinkish. There is barely any beading on the dress and they used sequence instead. It also had black dotâ€™s on the outside of the satin that looked like pen (maybe used to make the label after the ball thing). Nothing like the original color and it was the only thing I was really pressing when I ordered the dress. I looked at the return policy and it stated that if the color was wrong they would fully refund. I emailed Jaime and thatâ€™s when it went bad. Emails came back from Jaime saying â€œyou donâ€™t like, itâ€™s not our faultâ€�. Jaime would stop returning my emails and kept repeating the same comments. I had all the email communications saved since the beginning and Jaime kept saying that I picked the color and it was my responsibility and therefore, they do not have to refund because I picked everything. When I started sending the copies of the email communication where Jaime had told me that they could match â€œno worriesâ€� and the email where Jaime TOLD me what color matched the photo that they in the factory, no return emails. called the general manager and she answered. It was Ella. I talked to her for 10 minutes, told her what happened. She said she would email me with a reply. I went to my computer to send her the email communications that I had with Jaime. As I was sending that to Ella, she emailed me and said simply. â€œwe will not return, donâ€™t be angryâ€�. I literally was shocked, it had not been 10 minutes since she got off the phone with me. She must have just called Jaime and emailed me a response. NO research into my complaint at all. There was clearly no time for her to read my email communication for 2 months, review the issue with Jaime and talk to me. Not good. I sent an email back to let Ella know what I thought of the situation with attached emails from Jaime that showed clearly that Jaime made promises that were not kept and sent the attached photo that show the difference in color that cannot be questioned. She came back and said I had a point. So the solution: â€¦ they would make another dress and only charge me cost but no refund. I was done at that point. In the end, Ella admitted they donâ€™t have the color in the original photo. They matched the color â€œas close as possibleâ€� which is tanish/pinkish color. Not good. These are Chinese companies and buy everything discount and get what they get and thatâ€™s it. The sales tactics are to get you to purchase no matter what. Jaime should have told me they could not match the color in the beginning, but knew that would cost the company a sale. They will never refunded because they canâ€™t afford to. They have a refund policy on the websites that allows people to think there is a process in place if there is a dispute, which is not the case. Itâ€™s all sales tactics meant to get the money and in the end they would never give the money back, but will ask for more money as a solution. Do they think Iâ€™m nutâ€™s to give them more money! My case was a clear case of misrepresentation and I have the emails and photographs to prove it and all I got in the end was a pink dress with a request to send more money. Just donâ€™t buy from EllaBridalDress.com you donâ€™t know what you will get. Thanks Chris for submitting this review! I went to the site and noticed that they (like many of these China based companies) use wedding dress designers' pictures to show the gown they are replicating. Have you ever wondered why they don't put up photos of what their copycat dresses look like? Because they know that they would not sell very many dresses that way, even though their prices are low. 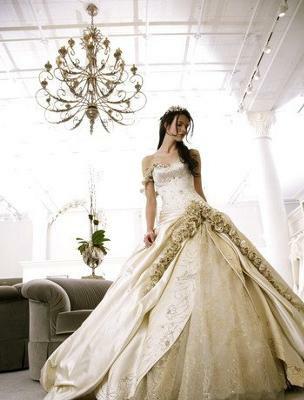 Brides would readily see that the quality of the designers dress can't be accurately duplicated. Some China manufactures are starting to market their gowns using their own pictures. I noticed that Lightinthebox.com used to have a lot of designers' photos, but now they seem to be using their own photos. My suggestion to brides who want to try out ordering a dress overseas... the first thing you should do is only consider companies who picture their own products and not designer photos. This way you can get a better idea of what you are getting. Still you need to do your homework when it comes to ordering a gown as mentioned in the article on ordering Chinese Wedding Dresses and Ordering wedding dresses on eBay from China article.